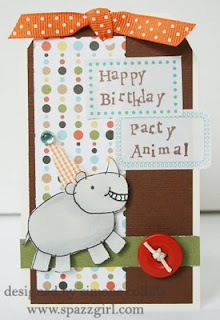 Last week's tag challenge over with Louise was to make a birthday tag. And since you can never have too many birthday greetings, I decided this was a good project of the week. In fact, the only thing I made all last week. Here's a little video of the entire process, start to finish. Stamped Tag with Copic Markers Tutorial from spazzgirl on Vimeo. Also available on Youtube... HERE. I am getting ready for CHA this weekend and trying to get all my ducks in a row is a much harder job than I expected. But I can't complain because I get to leave this freezing cold town for 6 whole days. Hope everyone is starting the week off right! Tag Details: Cardstock by Bazzill, Patterned Paper by American Crafts, Gingham Paper by A muse Art Stamps, Rhino Stamp by Stampin Up, Ribbon by Creative Imaginations, Labels by Martha Stewart, Button purchased from Oriental Trading, Twine from Target Dollar Spot, Colored with Copic Markers in C1, C3 and BG15, White Gel Pen is Inkssentials by Ranger Ink, Traced with Copic SP Multiliner in Black size .05, Genstome by Hero Arts, Adhesive from Glue Dots and Scrapbook Adhesives. I use 3M ATG gun on all my projects!! Simone, have a great time in Sunny California! What part of CA is CHA being held? This is ADORABLE! Gonna watch the video now! Hey so I'll be in Anaheim Sat-Thurs with Greeting Farm and Unity. Hope to see you! have a fun time at CHA! come back and tell us about all the good stuff you saw.